1 A NonClustered index can be extended by including nonkey columns in addition to the index key columns. The nonkey columns are stored at the leaf level of the index b+ Tree. 3 KeyColumns – These columns are used for row restriction and processing E.g they were used in WHERE, JOIN, ORDER BY, GROUP BY etc. 4 NonKeyColumns – These columns are used in SELECT and Aggregation. For e.g. AVG(col) after selection/restriction. 6 Please note that you cannot add a column in Key column section and a NonKey column section. It is either a key column or a non-key, included column. 7 A nonkey column will only be stored at the leaf level, however. There are some benefits of using non-key columns Columns can be accessed without extra lookups (RID lookup / Clustered Key lookup). It will reduce IO operation and improve performance of queries. 8 Included columns do not count against the 900 byte index key limit enforced by SQL Server. 9 Data types not allowed in key columns are allowed in nonkey columns. All data types but text, ntext, and image are allowed. 10 Included columns do not count against the 900 byte index key limit enforced by SQL Server. Please check out the above example where we have a column in Include column with size greater than 900 byte. --Now here you can see that even you have NonClusteredIndex still table scan is used. 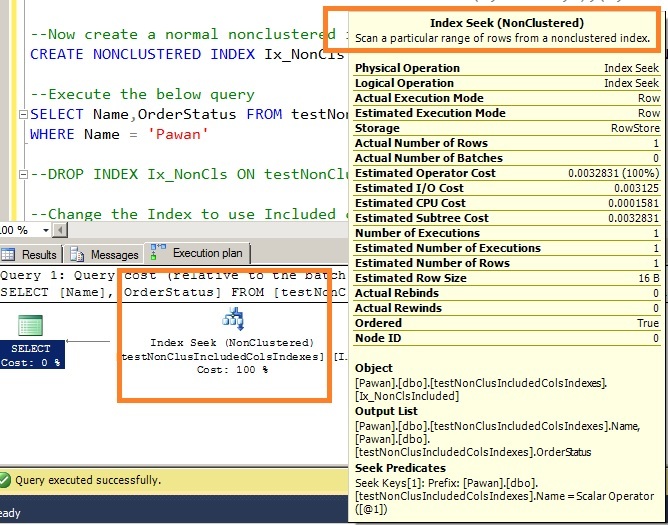 Now let’s drop the above index and create NonClusteredIndex with Included column. --Execute the below query and check the execution plan. 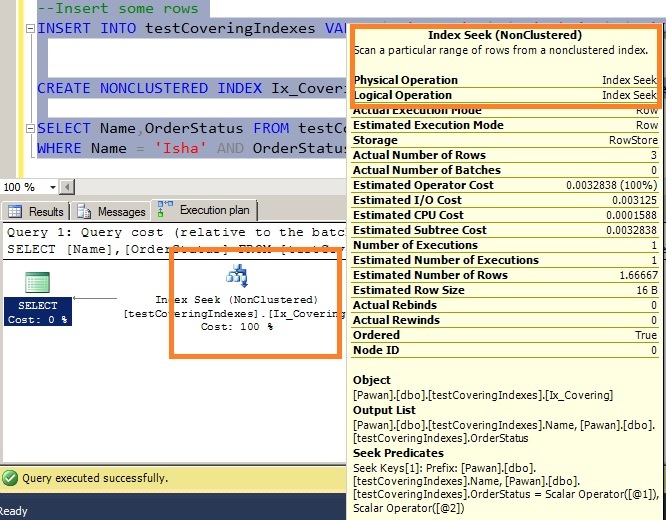 1 In covering index all columns returned in a query are in the available in the index, so no additional reads are required to get the data. 2 A covering index will reduce the IO operations and improve performance of queries. 3 Please find the example of covering index below. 4 Now let’s check whether can create index size greater than 900 bytes. NOTE – yes we can but a warning will come. Warning! The maximum key length is 900 bytes. The index 'Ix_CoveringInx' has maximum length of 1100 bytes. For some combination of large values, the insert/update operation will fail. Data types not allowed in key columns are allowed in nonkey columns. All data types but text, ntext, and image are “NOT” allowed.